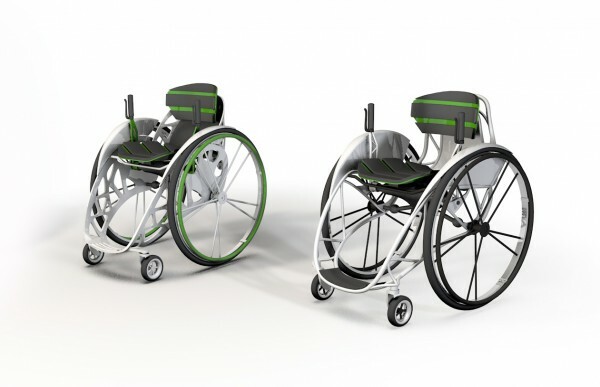 Desino develops a wheelchair with a dynamic seating system. This seating system transfers a constant natural movement to the upper body by means of a movable seat, which is connected to a lever propulsion. This upper body movement is modelled on a walking person. Compared to regular wheelchairs the back is not in a static position, which has positive effects on the spine as well as the musculature, digestive and lymphatic system. Additionally Desino provides a hybrid propulsion system (pushrim, levers). The regular propulsion with pushrims goes along with a total blocking of the movable seat and has advantages regarding the manoeuvrability in tight-space areas and the overcoming of small obstacles such as steps. However, pushrims will favour wear in joints of the upper extremities at the same time. Literature has shown that the much more efficient lever propulsion relieves upper extremities to a considerable extent. Because of the more upright posture lever propulsions also favour the lung capacity of the wheelchair drivers. Furthermore, the lever propulsion is perfect for longer distances and consequently will lead to a more active lifestyle and positive effects regarding the cardiovascular system. Finally, the design of the wheelchair contrasts sharply with the existing models and will contribute to the acceptance and integration of wheelchair Drivers.